Did you hear the one about the Internet-enabled Coke machine? Actually, that’s for real. Also the Internet-enabled lawn sprinkler, automobile, espresso maker, big-screen TV, and refrigerator. We think nothing of Internet-connected cell phones – in fact, we generally expect that feature – and Internet connections are de rigueur for video games, navigation systems, and retail point-of-sale terminals. Hell, what isn’t Internet-connected these days? So how do you as an engineer actually connect all these seemingly unrelated embedded systems to the big wide Interweb? Slapping an Ethernet connection on the side of the box isn’t enough. You’ve also got to add TCP/IP software stacks, and drivers, and maybe some server-side code. Probably some security and intrusion-detection software, too. Then when you’re finished with the hardware, you need to have something to say; the network connection doesn’t do you any good unless there’s an interested and compatible machine somewhere out there to talk to. But wired connections are so passé. What you really want is a wireless connection, probably either through the cell-phone network (EDGE or 3G, perhaps) or a local mesh or LAN, like Wi-Fi or Zigbee. 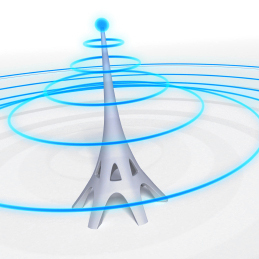 Do you really have the wireless, RF, and analog expertise to do all that? How ’bout the time and resources to verify its FCC compliance? Looks like the simple little network feature that Marketing asked for isn’t going to be so simple after all. Enter ZeroG Wireless, a smallish company that solves this exact problem. They make a little module with an SPI serial interface on one side and a Wi-Fi antenna on the other side. If you can find room for the module you can Wi-Fi-ify your system with a minimum of fuss. The module measures about 4 inches on a side, so it’s bigger than a postage stamp but smaller than your hand. It’s almost all shielded, and, as the saying goes, there are no user-serviceable parts inside. You basically connect it up and talk to it through the SPI port. All the rest of the magic is encapsulated inside the module, including the Wi-Fi protocols, WAP security, and radio-frequency wonderfulness. About all you have to do is find memory space to run a small amount of driver code… and find something for the device to talk to. It won’t auto-magically turn your Coke machine into a Web server, but it will get you connected. What you do after that is up to you. ZeroG has already certified its module through the relevant regulatory agencies in the U.S., Canada, the European Union, and Japan. If you’ve ever been through FCC or TÜV approval, you know that’s a nontrivial exercise. Having a pre-certified module can save you a lot of time, money, and counterintuitive engineering rework. If your networking needs are very short-range, you can use the module’s built-in antenna (it’s printed onto the PCB). For moderately long-range applications, you can screw in one of a dozen pre-approved whip antennas and get a few hundred feet more range. The Wi-Fi interface is built to 802.11b standards, so it ain’t fast. Figure on about 1 Mbit/sec if all goes well. But then, the SPI interface on the other side of the module isn’t especially fast, either, so it balances out. ZeroG isn’t expecting anyone to create multimedia Web tablets with its module; it’s more of a way to add connectivity to an existing product. The price? It’s about $18 in 10K quantities. If you’re buying just a handful, figure on spending $25 or so. That’s a lot more money than the individual components would cost you but still a good deal, considering how much effort would go into recreating something similar from scratch. Not to mention the tuning, standards testing, and regulatory approval. Even assuming you had the time and the talent to do these, you’d likely be no better off than just buying the module and calling it a day. So that’s the hardware part sorted, then. What do you do with your new Wi-Fi connection once it’s connected? First of all, we’ll assume there’s a Wi-Fi router somewhere in the vicinity and that it can hand out IP addresses to devices in its local subnet. Once you’re connected, you can configure your interface either through the SPI link or wirelessly over Wi-Fi. An iPhone or a laptop computer might be handy ways to do this, both at the factory and in the field. In fact, having built-in Wi-Fi means you can use it as your product’s main user interface. Instead of pushing buttons or twisting knobs, your customers might prefer tapping on-screen icons or keying commands into a keyboard. Physical size needn’t limit your user-interface options. You can have a teeny product with a big user interface, or vice versa. It’s also handy when your product is buried under something else or is otherwise inaccessible or awkward to reach. A little short-range wireless interface means you can talk to it without needing to touch it. Internet connectivity is secondary; just near-field connectivity might be useful enough. So now there’s no excuse not to program your network-enabled espresso maker from bed, turn on your sprinklers from the office, and grab a Coke from down the hall. Time to get working. ZeroG is even more popular than we thought. Just today, microcontroller behemoth Microchip acquired the whyole company for an undisclosed amount of money. Evidently Microchip thinks enough of ZeroG’s wireless modules to buy up the whole firm and add Wi-Fi capability to its own product line. A good move for both sides.